A new version of Steam's gaming software, called Big Picture, aims to liberate PC gamers from their desks with an interface designed for living rooms. Steam's Big Picture mode will launch in beta on Monday for Windows users. A beta for Mac is coming soon. Unlike the mouse-driven interface of Steam's desktop software, Big Picture is meant for a game controller--though it also supports mouse and keyboard input. Game icons are replaced by large tiles, and navigation is driven by directional keys and buttons, rather than a cursor. For typing, Big Picture has a unique keyboard layout that groups letters and characters into clusters of four, each mapped to a single face button on the controller. Users simply point to the cluster they want using a thumbstick, then press a face button to select a letter. This seems faster than moving back and forth to select letters on a traditional QWERTY layout. Of course, Big Picture isn't very useful without a way to play PC games on a big screen. 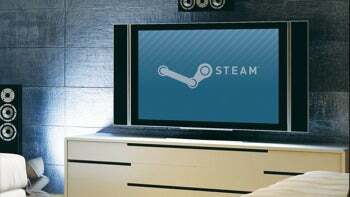 Valve recommends using a dedicated gaming PC for the living room, or connecting a powerful laptop through HDMI or other video output methods. If you want to leave your PC at your desk, products that stream audio and video from a PC to a TV, such as WHDI devices, may work, but they're less reliable if the computer is in another room. Big Picture is another sign of Valve's intentions to move beyond PC game development and distribution. A recent Valve job posting sought a hardware industrial designer to "fill a void in the marketplace" by innovating in the computer hardware space. Last weekend, the New York Times reported that Valve is experimenting with wearable computing, such as a virtual reality headset. A rumor from March hinted at a modular PC or gaming device from the company. But let's not read into this particular development too much. Valve tends to move slowly--the company has left gamers hanging on the next episode of its Half-Life series for five years now--so whatever's next is probably a long time away. Valve's Greg Coomer tells Kotaku that, for now, the company just wants to release Big Picture and learn how people use it.